If any readers are after some custom dice for their Ogre army then please let me know. My order has arrived and the Great Maw is very happy with the result. 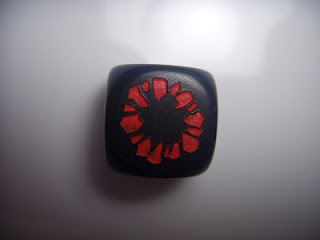 The dice are black 16mm with red pips. The Great Maw has replaced the "6". I'm selling in blocks of 20 and have three sets left. They are $40 (AUD, USD, NZD) or GBP30 per set including postage.